West Long Branch, NJ – St. Francis College Terriers let an 18-point lead in the first half slip away as the Hawks of Monmouth University rallied in the second half to beat the visiting Terriers 79-73 on Thursday. Jessie Steele scored 16 of his 18 points in the second half in Monmouth’s upset bid over St. Francis. Teammates Dion Nesmith and Andrew Nicholas chipped in with 15 points apiece for the Hawks. Marcus Ware was also in double-figures with 12 points. The Terriers led the Hawks 36-18 at the 5:57 mark in the first half but Monmouth was able to cut the lead 38-29 after the hosts went on an 11-2 run to finish the first half. The Hawks opened the second half on fire with a 15-5 stretch as Steele hit a three-pointer to take a 44-43 advantage over St. Francis with 14:54 remaining. The Terriers regained the lead 45-44 with a Brent Jones jumper, but Nicholas scored five straight points for Monmouth to spark an 11-1 spurt. With just 29 seconds left to play the Hawks were up 77-68. St. Francis then scored five straight points in the next 21 seconds to shrink the lead to just four. 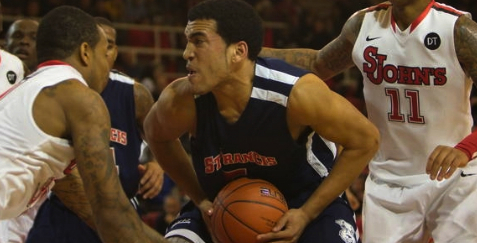 However, Steele responded for Monmouth by sinking two clutch free-throws to seal the victory. St. Francis shot 47.2 percent overall (25-of-53) and 38.9 percent (7-for-18) from behind the arc while the Hawks shot 42.6 percent (26-of-61) from the field and 27.8 percent (5-for-18) from long-distance in the game. Monmouth also forced 21 Terrier turnovers and outscored St. Francis by a 27-15 margin off miscues. Sophomore sharp-shooter Ben Mockford led St. Francis with 16 points as freshman forward Jalen Cannon posted his eighth double-double of the season with 15 points and 14 rebounds. Teammates Akeem Johnson (12 points) and P.J. Santavenere (10 points) were also in double-figures for the Terriers. With the win Monmouth improves to 11-19 overall and 9-8 in Northeast Conference play. St. Francis falls to 15-13 overall with a 12-5 record in the NEC but more importantly drops to fourth place in the conference standings after the loss. The Terriers were tied with Robert Morris, who also played yesterday, for third place before Thursday’s match-up’s but Robert Morris defeated Sacred Heart 55-53 and took over sole possession of the #3 seed. Both teams play their last game of the season on the road tomorrow afternoon. If Robert Morris loses and St. Francis wins, they will be tied again for third place. In that scenario, the Terriers will be the #3 seed because they own the tiebreaker having defeated Robert Morris twice this season. St. Francis will travel to Fairleigh Dickinson on Saturday at 2:00 p.m. before hosting an NEC Quarterfinal contest on March 1 at 7:00 p.m.